One feature which CRM introduced and is available in the SAP Solution Manager 7.2 with SP06 is the ability to enter formatted text with embedded (inline) screenshots. We have ensured that this new feature can be used in the Solution Manager IT Service Management scenario when users create incidents but there are a number of limitations you should be aware of before you proceed. Formatted text with screenshots is only available in the CRM WebClient UI. You cannot exchange formatted text if you send incidents to SAP for processing by SAP Customer Support. You cannot exchange formatted text with the external Service Desk interface. Fiori applications such as “My Incidents”, “Create Incident”, “Resolve and Dispatch Incidents”. Web Dynpro UIs, such as the Test Suite, or the Incident Management work center. Check frequently for updated notes and corrections related to this function. Since this is a new feature, it is still being refined. See the Further Information section at the bottom of this article for existing master notes and related documents. SAP Solution Manager 7.2 SP07 has further functions to ease the use of formatted text and to improve its integration. Since we continue to improve this, we always suggest you update to the latest SP for the best experience. Use UI configuration to enable the assignment block in the CRM UI which supports formatted text. I’ll go through these steps below. These customizing entries tell the CRM system to activate formatted text conversion and storage for the corresponding text types. When you select “HTML-Text”, the system will use the new text storage area for HTML formatted texts with the embedded image capability. You can also add an entry for Trans.Cat BUS2000116 (Service Orders, including Change Control Management transaction types), or BUS2000224 (Problem transaction types) if you use these. BUS2000223 specifies Service Requests including incident transaction types. These customizing entries tell the CRM system to use the new formatted text editor with embedded image capabilities in the CRM UI component GSTEXT (see next step – UI configuration). Enable the GSTEXT assignment block in relevant WebClient UI components. Navigate to an incident in the CRM WebClient UI. The configure page toolbar icon (you may have to activate this button in CRM WebClient UI personalization – see the CRM WebClient UI documentation for further details). Rich Text Editor wiki article in SCN. Thanks! I’ve added a reference to the note and PDF at the end of the blog article. My understanding of the comparison between GSTEXT and TEXTMGMT is that you don’t need a separate view with TEXTMGMT. Based on the screenshots in both the comparison and your blog, it looks like you are using TEXTMGMT since you have the capability to show the rich text content without having to open a separate window? However I can’t see any option to display TEXTMGMT in ITSM SP08. Right now, we tried to activate GSTEXT but don’t have any option to display the content on the ITSM page – it opens in a separate window everytime. I don’t understand note 2568144… according to the note I should not enter text types in CRMC_TEXT that are maintained with “P” in COMC_TEXT. So, I have a text profile containing SU99, SU01 and SU04. If I want them to use as “HTML-text” I should delete them in the text profile and add them in CRMC_TEXT instead? Or do I need to create a complete new text profile? You only need to remove the P from the respecting Text Profile in COMC_TEXT. Not in all text profiles. thanks a lot for implementing this feature. First, let me tell you that our users biggest paint point is that embedded pictures are not possible currently (on SP4). So we are really excited hearing about this and your blog entry. We have configured a SP6 Sandbox system for evaluating this funcitonality. We’ve setup everything according to your (very clear) instructions and were able to play around with it a bit. As far as we understood, “old” Solman Assignment Block “AIC_LONGTEXT” becomes obsolete when using embedded screenshots, instead component GSTEXT / TEXTMNGMT have to be used. Can you confirm this? When maintaining View CRMC_TEXT and enabling the HTML text we got a message (UIU_TEXT21) which confused us a bit, as we understood it that “old” texts cannote be read anymore after the switch. However we found that in GSTEXTS we still find the old text types. Can we discard this message? I have a couple more questions but would like to wait for your response on these first. Yes, you should be able to replace AIC_LONGTEXT completely with the GSTEXT assignment block. AIC_LONGTEXT does not support the new formatted texts, while GSTEXT supports both old and new texts. CRM does not like it if you switch back and forth between types of formatted texts. GSTEXT can still read both types, but it was always my impression that CRM prefers if if you create completely new text types for the new formatted texts. This way, the system will read a specific text type from only one repository, instead of having to look in the old and new repository for a single text type. This is something to consider when moving to the new formatted texts: the cleanest way would be to create completely new Z-namespace text types, and then perform the switch only once. thanks a lot for clearing this up. I understand point 2) perfectly, this would result in some major changes on our end but well, the embedded texts feature would most likely be worth it. However, I’m not too happy with exchanging AIC_LONGTEXT with GSText. But maybe we were just using it wrong, or are already too much used to the AIC_LONGTEXT functionality. Anyway, I feel that the user experience with this block leaves room for improvement. 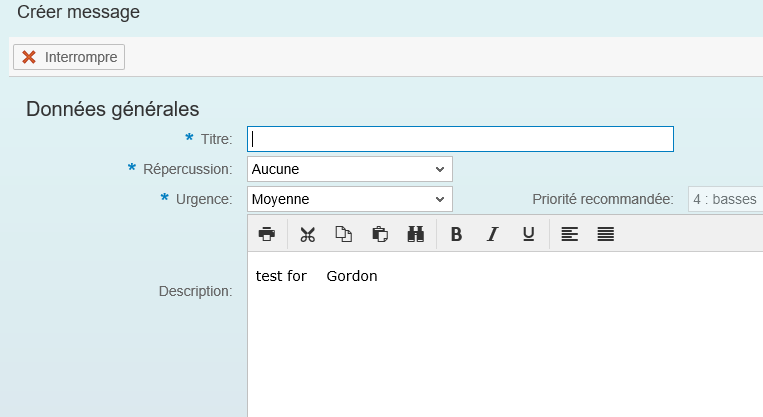 do you know if this rich text editor is planned for Fiori apps ? i noticed TinyMCE libraries are available in SAPUI5 libraries. 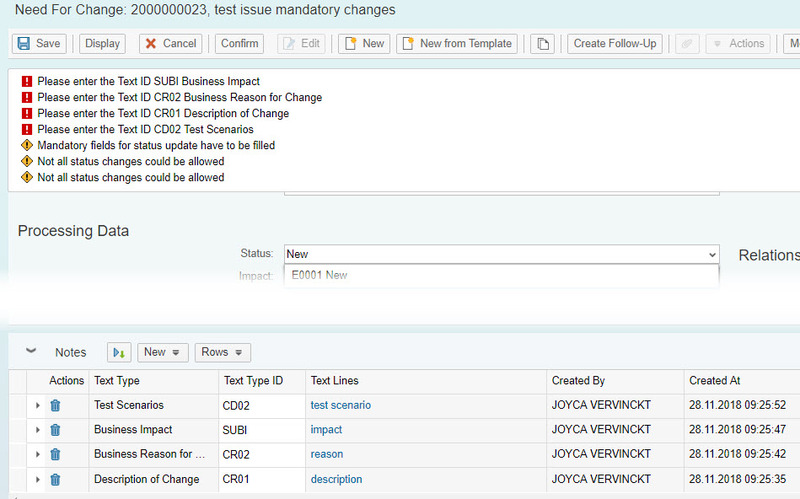 Is there a guideline to implement it in SOLMAN Fiori apps ? You are correct that the TinyMCD libraries are available in the SAPUI5 libraries. Unfortunately, I am not permitted to comment on features planned for future Solution Manager releases. I can only suggest that you review the release notes of future Solution Manager support packages and keep an eye on our blogs and other information channels for when we are permitted to disclose such details. Hope it will come soon on solman. Do you know how i can add some additional buttons in tinymce default toolbar ? No, I’m not sure how to do this in the context of the CRM WebClient UI. As far as I know, this is a development task for the WebClient framework: it would take quite a bit of effort to change the buttons within the toolbar – unless you are developing your own UI5 app. There’s documentation for that. That’s interesting. Perhaps you should create an incident for this; our specialists will analyse the issue. Thanks Gordon, I actually did create an incident last week as well 🙂 Hope I get a solution from there, I’ll post something here again then to share the solution. I found the root cause: there is part of the rich text handling logic missing on your SP06 system. This logic was part of our further enhancements for rich text editor and was delivered with SP07 release. Unfortunately the dependencies involved are too high to downport the change to SP06 with a note. Actually the new rich text editor was not completely rolled out in SP06 thus part of the logic was still under development and not ready. If you really need to have the mandatory text check for status changes, I would suggest you can use the standard text editor for those text types for now. Thanks for reporting this. I’ll see if I can update the blog so that this information is more obvious. you can maintain text types with a direction “reply from processor to reporter” which can be added to a mail form that is sent on e.g. the Proposed Solution status; e.g. the SUSO Solution text type. However again if the texts are html; also SEND_MAIL_WITH_MAIL_FORMS method does not “find” these text types anymore and cannot add them to an email. Non-html text types are still found. I hope when we upgrade to SP08 that both these issues will be resolved. I have tried to implement this feature but i’m facing a problem. I’m able to add an image in the Rich Text Editor but they are removed each times the page is refreshed or when I tried to save. .
Could you please tell me if I miss Something? in ITSM we have configurated gstext to be able to paste screenshots in su99. Now I have no possibility to make the Texttype SU99 obligatory, when creating an incident. The Workaround via “Specify Status-Dependent Required Fields” cannot be used, because I want to have the text mandatory, when creating the incident, so to say in the initial Status and therefor I get no Statuschange-Trigger for the Check. How can I check, if the SU99 Text is maintained, when saving the Incident for the first time?